Tomorrow is going to be a very sad day for me. It's the day I'll use the last trip on my last value Metcard, and will effectively be forced to buy a Myki card. The sale of multi-trip value cards stopped at the end of June, and I had meant to stock up on a few hundred dollars worth beforehand, to delay the inevitable, but I forgot about it, due to focussing on a long essay for uni. Instead, I'm going to be forced to use the worst public transport ticketing system I've ever seen. It's an example of how not to run a project: 5 years late, $1b (200%) over cost, massively scaled-down requirements, and an implementation that doesn't work properly. Ok, perhaps you can't make it out, but on top of each of the repurposed Metcard barriers, there are cardboard signs, with such slogans as "Don't tap", "Don't swipe" and "Touch, Hold Still, Go". These signs are up all over the place at most stations. They are instructions on how to use the system; an afterthought I am sure. Why do they have to have the instructions? You should just be able to move your wallet somewhere near the reader, right? Just like Oyster Card, perhaps? Good luck. If you hold your card flat on the reader for 1-2 seconds, it will read about 95% of the time, and if you don't touch your card according to spec, that reduces significantly. This is enough for the barriers to get clogged up with people struggling to get their cards to be read. Now imagine this success rate with a few hundred people trying to exit within the space of around a minute or two. Every day, I've gotten stuck behind someone whose card hasn't been read properly. I've just side-stepped them as they've gone to a different reader, and I've been through with barely a pause at the barrier, but now I'm going to be one of the people stuck at the reader. You can even see that in the picture above, there is a guy bending over; he's opened up a barrier for repairs. Off the right of the picture are about 4 plain-clothes met cops. I don't know if it's relevant... I just hate secret police. With hardware performance like that, some smart people thought it would be a good idea to, rather than implement a simple zone and billing system, try to charge tram journeys in a way that would require touching off at the end of a journey. Imagine a tram, blocking up the road, with 10 people clustering around a small reader, each taking 2 seconds to hopefully read successfully. I think they've canned that part of the project, like the idea of using it as a general payment card. Both these cut requirements are good for the long run though. Who needs a public transport card as a general payment card? That's just asking for trouble. It's already too much that the government will know where I am at regular intervals; it's far too much for them to also know on what I'm spending my money. I've lived in the UK, where the Oyster Card system had its share of teething problems. But not like this. The Oyster Card system cost, officially, around £160m, for the initial implementation for a city of around 7m people, compared to about 6 times that amount for a city just over half the size. And with the Oyster Card system, tapping my wallet on the reader was sufficient to be able to walk through so quickly that I never actually had to stop. Now, it might look like some of my numbers are off regarding the cost Myki compared to Oyster Card, but that's because Myki has taken so damned long to implement that the dollar has had time to go from around 40p to about 66p. I actually registered mykisucks.com, and a couple of other related domains about 3 years ago, intending to document all the issues I had heard about its development, but never bothered. I guess Wikipedia comes to the rescue though, in documenting all the various issues with Myki. Oh well. I guess I'm going to have to use this crappy system now, which saves a negligible cost when working perfectly, and overcharges at other times. At least there is mykileaks.org to help me figure out when I've been over-billed. I don't know if it will cover all the occurrences I've seen where the readers have been broken, and people have been directed to just exit the station. I'm guessing those people have all been overcharged. The advertising for Myki has recently been talking about how the Metcard system is being switched off by the end of 2012. My first thought was "What about tourists?" 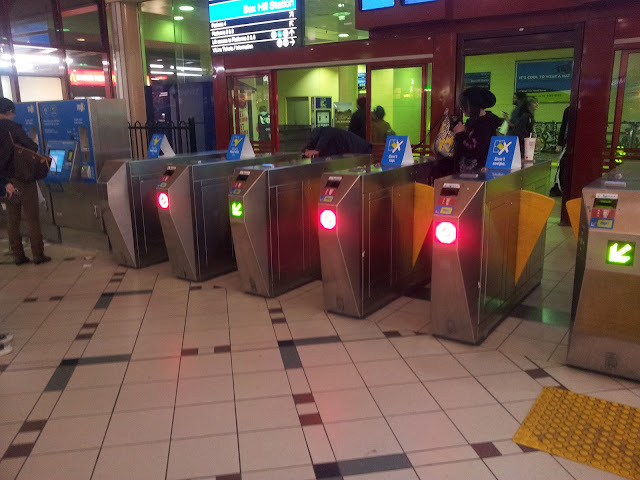 Apparently, they'll still be forced to buy Myki cards. Imagine that, or any similar use case where a person has lost their Myki card: At a non-premium station where you can't buy a Myki card + Don't have a Myki card = Screwed. I don't have any experience in public transport systems, but I reckon I could do a way better job if given a billion dollars. In lieu of putting anything up at MykiSucks.com, post your complaints in comments. There's usually tumbleweed blowing through my comment section, but surely there are enough people in Melbourne who hate Myki to rant along with me here. I'm amazed when mine works after holding it for only 2-4 seconds. I've held it on a reader for at least 5 before. I true to top my Myki up at stop no.1 Melbourne University today. The singular myki machine's touch screen refused to work however. I rang the help number on the myki machine (13myki) and was promptly informed the no. was no longer active, but that I was being transferred to transport Victoria or some other service. After 3-4 sub menus I got in contact with someone to tell them about the machine so it could be fixed. The lady on the line also said she would run a search to see where I could top-up nearby. Her search came back with zero locations. She suggested going and getting some money out at an ATM and buy something to get some loose change to buy a Metcard on the tram. I was pretty incredulous at this stage and asked if they were really going to get rid of Metcard, and that if they did- what would someone like me do in a situation like this?